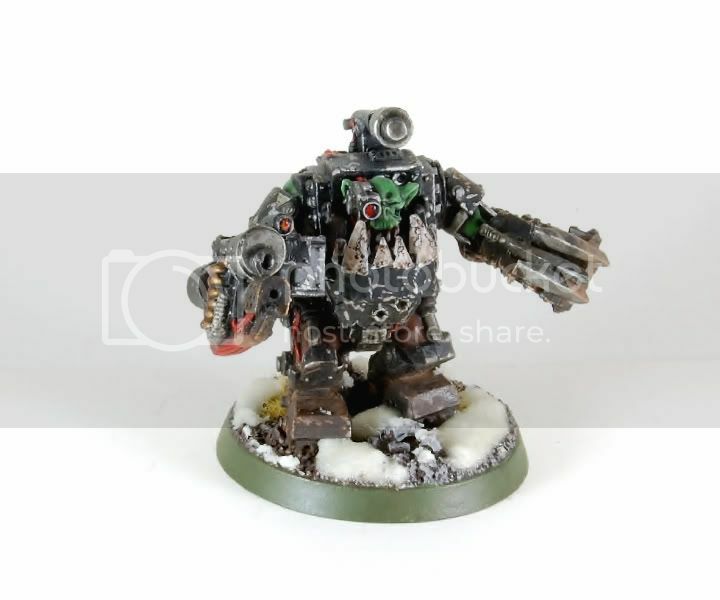 122nd Cadian : Greek Warhammer 40K adventures: Orks...? I received some very distressing news to day (for my hobby that is). The local GT is going to take place in the first weekend of October. I was expecting it to be on the last weekend on November though (like every year). This means that my Imperial Guard army is not going to be nowhere near being painted for tournament standards. ORKS! Because iliteracy is KEWL!!!11! Big G goes with one unit of Meganobz and the Mek rides with the Burna Boys. All Battlewagons stick together to benefit from Kustom Force Field for the first turn and then get some charges in on the second turn. Everything can pretty much charge on the 2nd turn with a 28'' range. List is lacking long range anti tank weapons that's why I included the Boardin' Planks. 6 x S10 and 16 x S9 15'' range attacks can pretty much kill any vehicle in the game. Not sure about the second unit of Meganobz but I needed another Battlewagon and since I got the models I thought that was the best idea. I could replace then for some regulars Nobz but I really don't know. I guess I'll stick with the plan. There are many nasty armies out there that could destroy all my vehicles on the first turn but as long as it's not Space Marines, Eldar, Blood Angels, Dark Eldar, Tau, Space Wolves, Tyranids or Imperial Guard I will be fine. So bring it on Necrons!!! Yeah, I am as frustrated as you with this ... I was also hoping to have my Imperial Fists ready but again this is out of the question, which again leaves me with my Orks again. Interesting list, but as you said, loads of antitank out there for these poor battlewagons... I'm also not so sure about these Meganobz either. Have also to work it out myself. I do need a second unit of Nobz to get a fifth Battlewagon. It makes the list much more potent to have as many as possible. Instead of 3 Meganobz I could use 3 normal Nobz with 1 Power Klaw and max out the other Meganob squad. Looks like a powerful army to me, not many armies would look forward to a second turn charge from that lot. As you say, there are a lot of armies that can take out the battlewagons first turn but the KFF gives you a chance and because of this I would always take first turn if you win the roll to allow you to get as close as possible before the firing starts. I look forward to seeing how it goes at the GT. A smart opponent will just deploy his forces on the other side from where you did so you won't reach him in the second turn anyway. He will also place his big guns at points where he can shoot your side (even rear) armour at the following turn. On the other hand if I am playing against an inexperienced player who is using, let's say Necrons, then I will probably get the first turn so I can get the second turn charge as soon as possible. I will keep you posted about the tournament.